We're not sure how to pronounce the name, but we are sure that this is a Sugden unlike those we're familiar with. For over four decades (!) 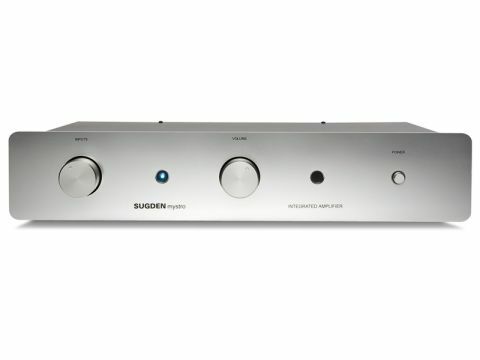 the firm has been synonymous with low-power Class A amplifiers. The Mystro changes everything, offering 50 watts of Class AB power from an all-new circuit. Mind you, in many ways it harks back to yesteryear, offering as it does a mere three-line inputs plus phono, single speaker outputs, no preamp or even 'tape' output, and remote control for volume only. Not the perfect hub for your budding multi-source, multiformat, multichannel system, then. But if all you want is, as Sugden's motto has it, 'simply more music', none of that will bother you and you're more likely to be interested in the minimalist design which uses exclusively through-hole components on a single-sided circuit board, with no frills, no unnecessary signal buffering, relay input switching, motorised potentiometer volume control and an ultra-simple power amplifier circuit. The output transistors are mounted on internal heatsinks which, unusually, do not have any vents above them, Sugden evidently relying on heat dissipation through the thin metal top cover and a couple of small vents at the back. Power is derived from a large mains transformer and is smoothed as usual by the reservoir capacitors, but not regulated for any circuit but the phono stage. Physical construction is simple but the thick stainless steel front panel and large, easily grasped, knobs give the unit an air of class. Power output may be quite low, but this amp was still well within its ratings at the loudest levels requested by our listening panel. Tonal matter was hardly referred to in the listening notes, with just one mention of excellent tonality. Based on our sighted listening, we're happy to concur with that, having enjoyed both the firm bass and the clear, crystalline treble, plus the spring-water-pure midrange in between. There's a lovely balance between vocals and instruments and the very good imaging helps maintain the illusion of real live performers sitting between and beyond the loudspeakers. As for rhythm and timing, these are also very fine across the board. The Led Zeppelin track was upbeat and lively, while the classical tracks also had a consistent sense of rhythmic urge. The large-scale Mahler symphony provided the best demonstration of the Mystro's excellent discrimination between instruments, without losing sight of the orchestra in this excellent recording. In the end, the impression everyone seems to have carried away of this amp is of vibrant music-making and a thoroughly captivating experience.